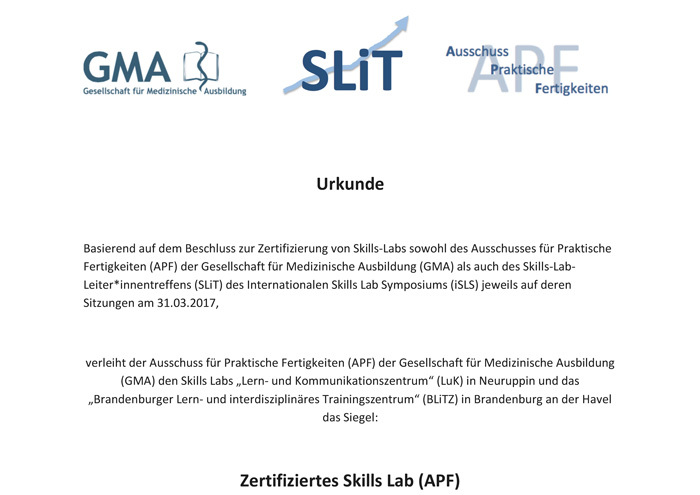 The Teaching and Communication Centre (LuK) in Neuruppin and the Brandenburg Centre for Learning and Interdisciplinary Training (BLiTZ) in Brandenburg an der Havel are the first skills labs in Germany to receive the quality label of the GMA’s Practical Skills Committee (APF). Over a 4-year period the APF had drawn up minimum and development standards for skills labs, with the aim to establish joint quality standards for skills labs in the German-speaking area, and had passed them on 31 March 2017. GMA as the issuing body is the gold standard for medical education in Germany. The certification of the MHB skills lab is dated 24 March 2018 and valid up to 24 March 2025. You find the pertinent certificate here.